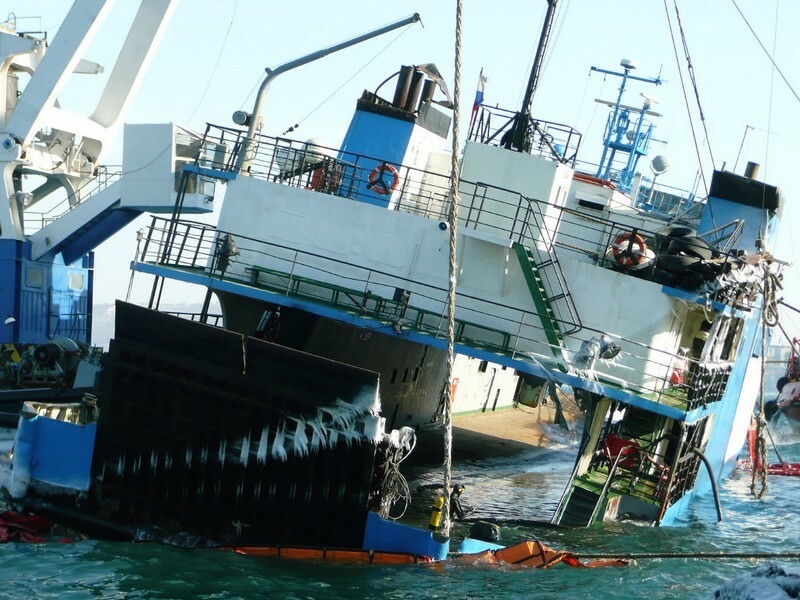 It is a complex of measures aimed at raising of sunken floating craft. There is no single universal scheme for performing such operations, since the order of operations, the use of special tools and techniques are largely determined by the size and condition of the vessel, its depth of flooding, the nature of the reservoir, bottom topography, and many other factors. Highly qualified specialists are also equally important to the successful performance of ship raising works. Construction of special rigid pontoons. If the watercraft is not completely flooded, has retained its integrity and the upper deck is above the surface of the water, the use of floating ability of object is possible while raising. For this purpose all openings under the water are welded and then the water is pumped out from compartments. At that the vessel rises to the surface on their own. Smaller vessels that are at a minor depth are raised to the surface with the help of floating cranes. 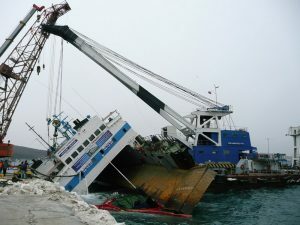 If the accident occurred near the shore, and the bottom has a smooth gentle slope, raising of the sunken vessel can be carried out with the help of tractors or winches and towing ropes. In cases where raising of the sunken vessel is required from a depth of 60m or more, rigid pontoons are used. These structures are capable of changing their buoyancy depending on the filling of them with water or blowing with compressed air. This method is the most complex and expensive, because it requires a large amount of diving work and considerable energy consumption. Transportation of the object to its destination, or cutting the body of the wreck. MRS has sufficient material and technical base and highly qualified staff to carry out ship lifting works of any complexity. Permits are provided for all types of services.